This is a selection of our best images. To load the full-sized images click on the icons. 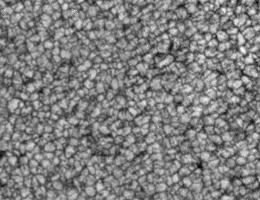 Near IR Image of Solar Granulation: A near IR image at 1.56 µm of solar granulation with the 65 cm vacuum-reflector. The granular contrast amounts to 1.6%. 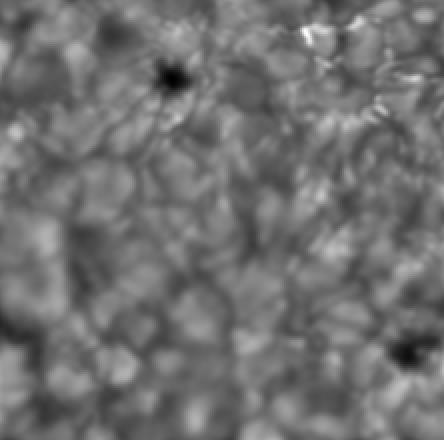 The exposure time was 0.1 ms with an image scale of 0.25 arcsec per pixel and the field of view of 65 arcsec x 50 arcsec. 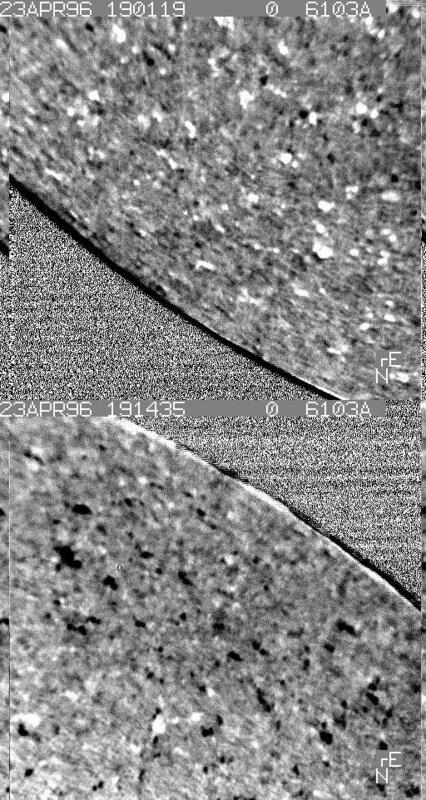 The image was taken on March 12, 1999. 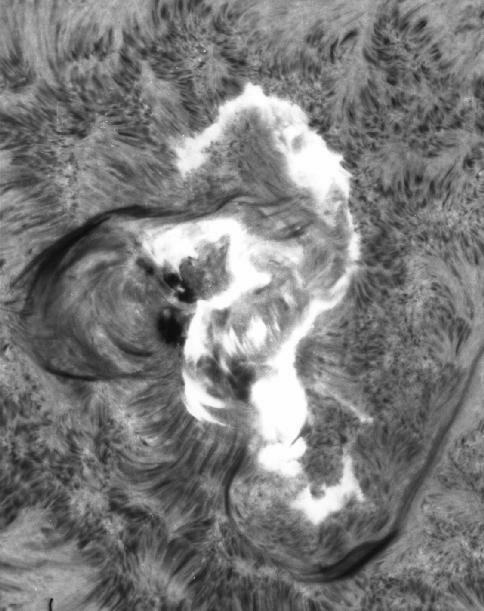 Full-disk H-alpha image without limb darkening: We have applied the same techniques as for our Ca K-line images to produce this residual image in H-alpha. It shows the residual structure of the disk after subtraction of an empirical `limb darkening' function. The contrast is enhanced to show the details better. The image was taken on October 29th, 1997. High spatial resolution speckle reconstruction: The speckle masking method has been applied to a sequence of 200 short exposure (approximately 10 ms) images taken within 2-3 sec. The FOV was 15.5" x 15.0". 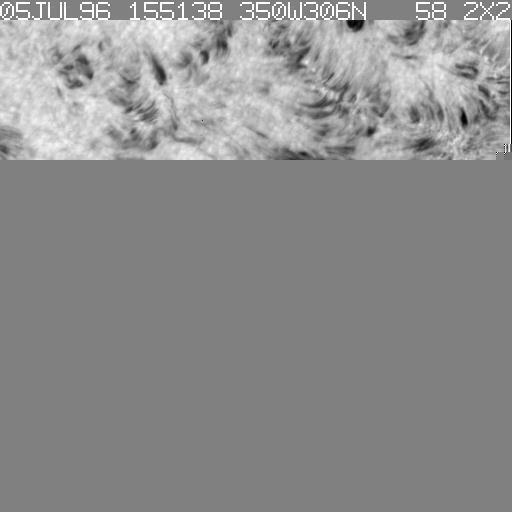 The image was taken in the G-band at 430.1 nm on August 14th, 1997. 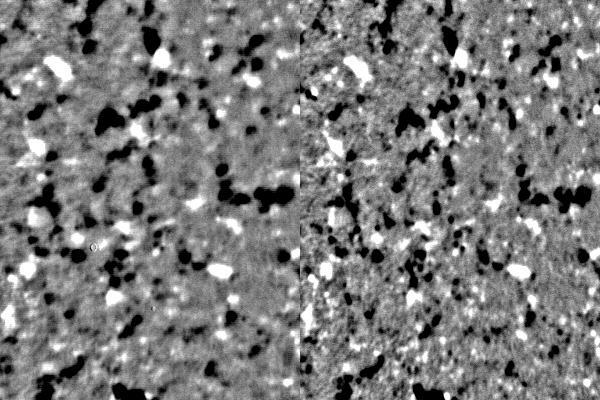 Full-disk white light image without limb darkening: We have applied the same techniques as for our Ca K-line images to produce this residual image in white light. It shows the residual structure of the disk after subtraction of an empirical `limb darkening' function. The contrast is enhanced to show the details better. Note the bright plage structures close to the limb. The image was taken on November 26th, 1996. 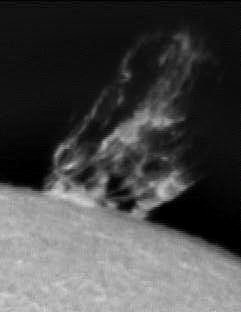 Prominence at the limb: A high resolution H-alpha image of a prominence at the solar limb observed at 16:17 UT on October 3rd, 1996. The Sun Celebrates Bastille Day! 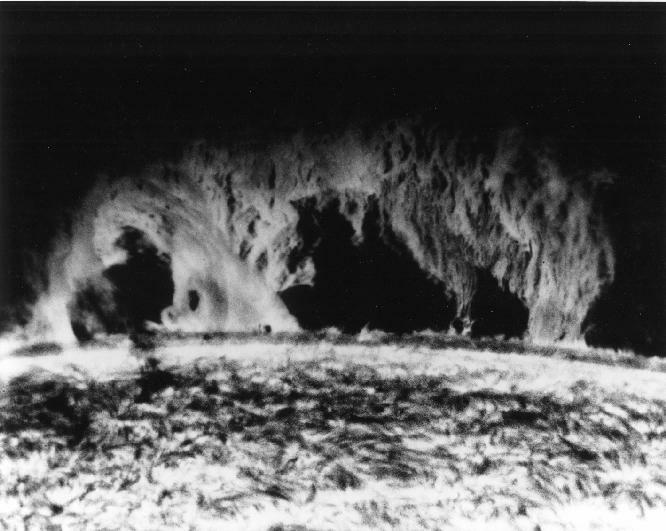 Flare eruption in H-alpha from region BBSO 3722 at 15:00 UT on July 14th, 1996 after limb transit. The flare registered C9 but probably was M-class. 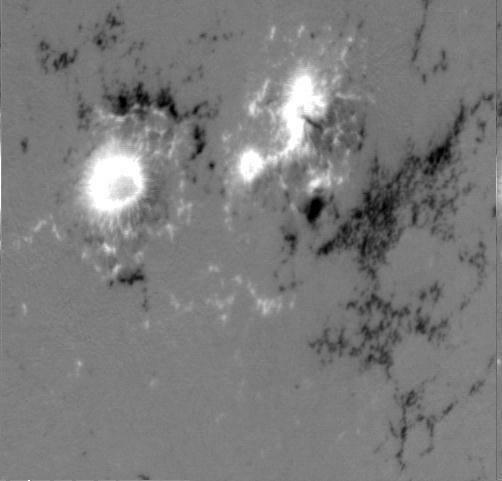 This image is clipped from our 2000 x 2000 pixel full-disk image. 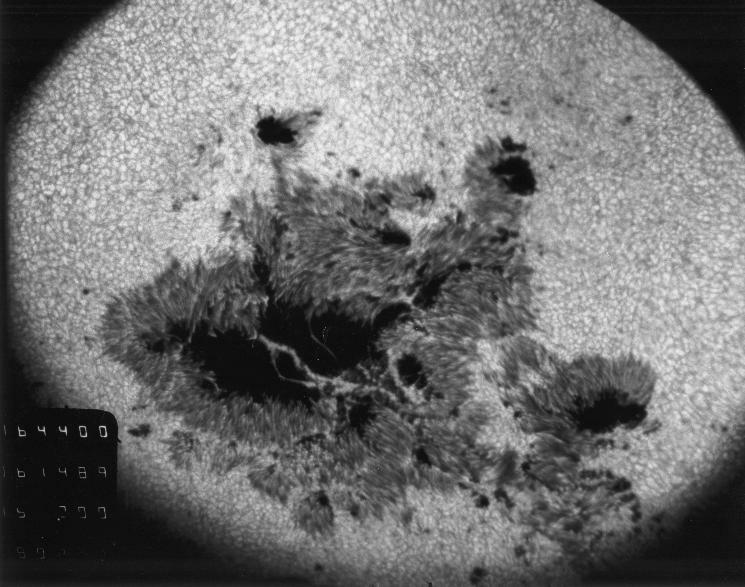 Improved magnetograms observed on July 5th, 1996: The effect of image selection and alignment on magnetograms. 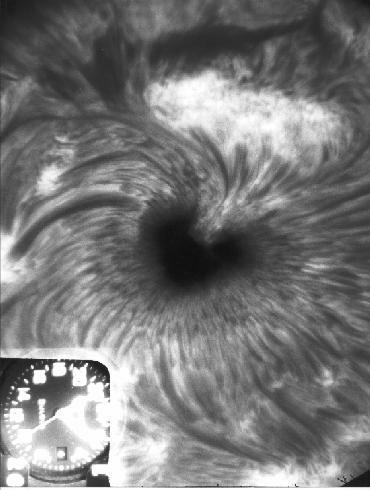 The left image shows the average of 60 short exposure magnetograms. The right image shows how the quality of the average is improved if only the best frames are used and if they are aligned before averaging. Magnetogram of NOAO region 7981: NOAO 7981 is the return of NOAO region 7978 which produced an X2.6/1b at 09:11 UT on July 9th, 1996. High quality magnetograms: The observations show the solar North (top) and South (bottom) poles on April 23rd, 1996. 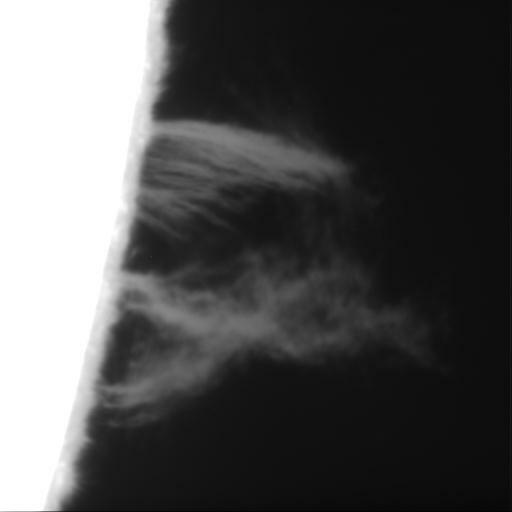 Limb Spicules: The Figure shows the limb of the Sun at different wavelengths within the H-alpha spectral line (from 0.1 nm bluewards to 0.1 nm redwards of the line center). Some of the spicules (jets) extend above height of 7000 km. The images have been processed with a high pass filter. 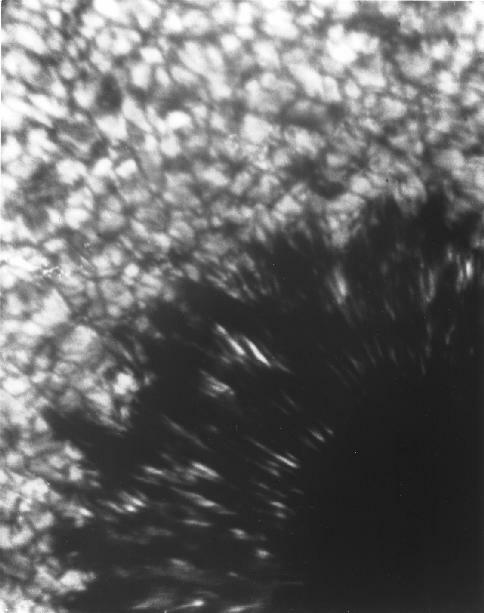 Sunspot observed on June 14th, 1989: A highly active sunspot with complex penumbra in white light. 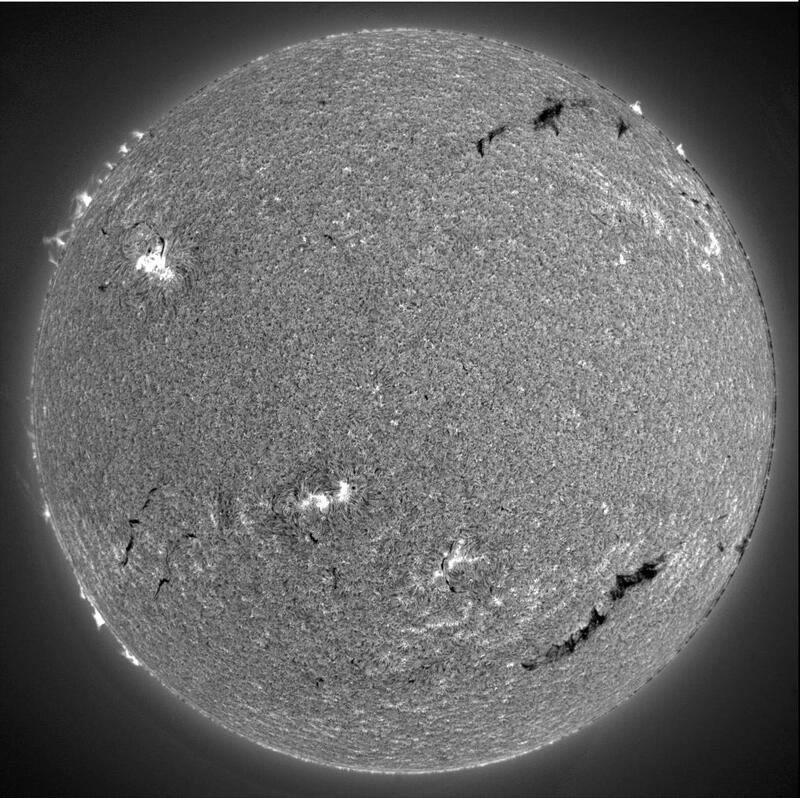 The chromosphere, so complex in H-alpha, is transparent and we see down to the granular pattern in the photosphere. 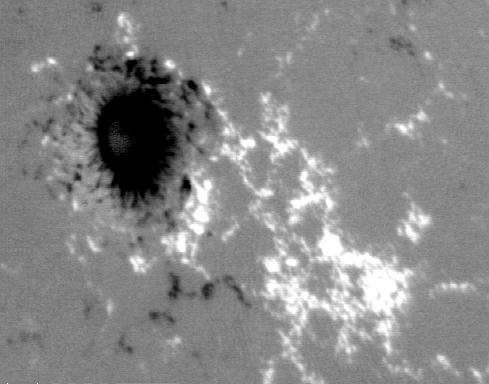 An even more highly enlarged image of the granulation at the edge of a sunspot: Radiating from the spot are the linear features of the penumbra. 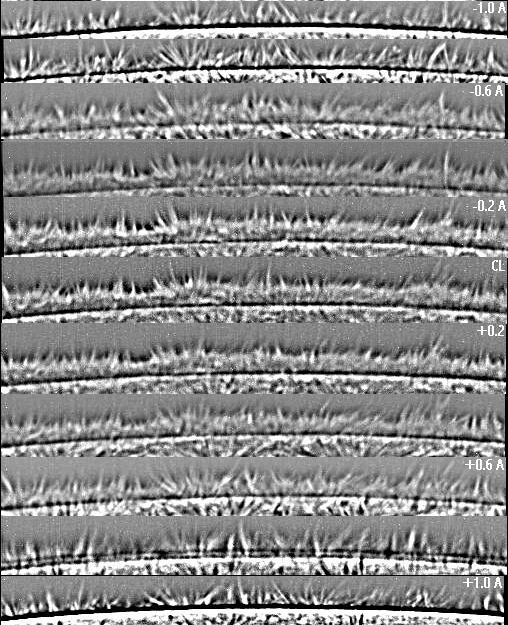 We see the complex structure of the granules, which are the tops of convective currents. 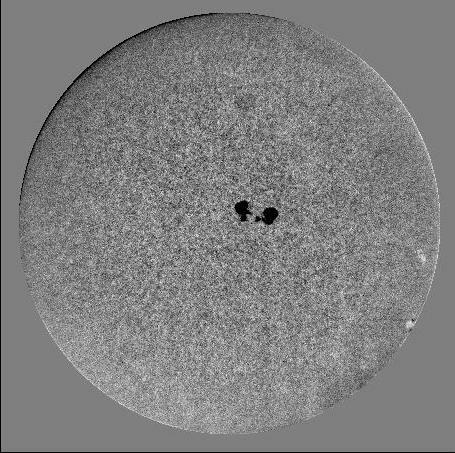 A simple sunspot in H-alpha: This high resolution image was observed on July 4th, 1974. It is easy to follow the H-alpha arches from spot to following plage above. 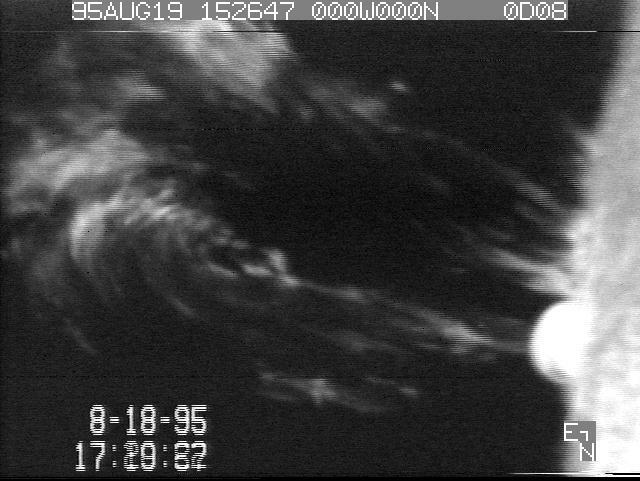 The great `Seahorse Flare' of August 7th, 1972: The second of two great flares in this regions. This image in the blue wing of H-alpha shows the two-ribbon structure late in the event, with bright H-alpha loops connecting the ribbons. A hot 40 million deg shell intersects the surface at the ribbons and condenses at the loop tops. 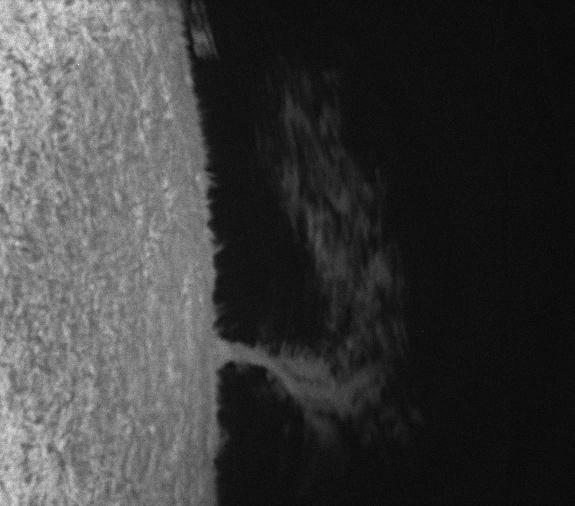 Prominence: A small quiescent prominence photographed at the edge of the Sun in 1970.